Something for another, a little something for me! Happy Feast of St. Catherine of Alexandria! The Recovering Dissident has some gorgeous art of St. Catherine, including this one, which I think (think) may be of St. Thomas Aquinas kneeling before her as the patroness of Philosophers. As St. Catherine is my confirmation saint, and St. Thomas is my Dominican saint… LOVE! 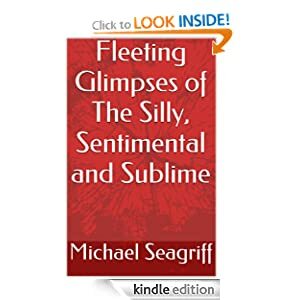 So on this special feast, allow me to recommend a little bargain of a book: Fleeting Glimpses of the Silly, Sentimental and Sublime by Mr. Michael Seagriff, OP. This is a lovely little treat of a book that is gentle on the brain and uplifting to the heart. I titled my Amazon review “Heartwarming,” because that’s exactly what it is. For only $.99, it’s a very nice bargain. I’m looking forward to reading more from this brother in St. Dominic! I also received in my inbox that the Catholic Writers Guild has approved Don’t You Forget About Me for the CWG Seal of Approval. It’s good news. My first novel, Jane_E, Friendless Orphan, was rejected (click to read more), so I appreciate that this one did receive it. It’s not an award, but it is a nice little balm to my soul–this time around. I realize there may never be another “next time,” so I’m grateful for this moment. Back to St. Catherine: today also happens to be the International Day for the Elimination of Violence Against Women. Considering Catherine’s story and that she was the original “girl power” saint, I can’t think of a more appropriate day. St. Catherine, Spouse of Christ, pray for us. Subscribe to the quarterly EMC Reader & get a free ebook! The only information Erin McCole Cupp MIGHT intentionally collect from you would be your email address and name, if you choose to subscribe to her newsletters (see below). You may unsubscribe to this blog at any time, and Erin will still love you. Like, in a Thomistic, willing-the-good-of-the-other way, not a creepy way.